I’ve spoken a few times on my blog how, frankly, my bedroom is a cupboard. I like to call it me ‘5* Harry Potter’ bedroom. However I’m not particularly fussed by the size of my bedroom. It’s kind of cute. And so long as I can sleep in there and it’s a comfy area for me, I’m happy. But it does need a bit of a makeover as I feel like I could make use of the space. So, as an interior a d d i c t, I though I’d document my bedroom transformation. From a bedroom wishlist, to hauls to before and afters, all the fun blog posts. I’m not sure over what time period, but it’ll be a fun time. 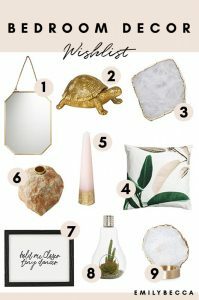 So today I thought I’d kick it off with a little bedroom decor wishlist, and whilst trying to stick to a good budget. So this is perfect for if you’re a student or you’ve just moved into an apartment and can’t splash out too much. You could get these as gifts for interior addicts too! Until recently, rugs weren’t really my thing. I think it was more the fact there weren’t any that caught my eye. But as the minimal boho trends come around there are so many rugs I want. I’m obsessed. And as I have a green coloured carpet a little rug would definitely help keep the my aesthetic needs at ease! I love all the patterns and materials at the moment, they’re such a simple touch to any room. And can keep a room a little warmer if you’re room tends to get cold in the winter. For ages I’ve wanted to add some form of statement mirror to my room. However with a small room I didn’t think it was possible as I needed the space for storage. But I’ve worked out a way to utilize my space and I can have a mirror which I’m all too excited about. Having a statement mirror in a small space can make the room seem so much bigger and brighter. So perfect for summer! Who doesn’t love a cosy bed? I’m all about making my bed as comfy as possible. So it’s like this cosy cocoon strictly for sleeping. So I’m always looking for bedding. But of course whilst keeping it aesthetically pleasing! Cushions are a great way to do this. I like having plain white or grey bedding so by adding some cushions it can spruce it up a little. H&M is my favourite place for cushions (and general homeware) right now! I don’t have too much wall space, but enough to add a few bits n’ bobs. I’ve recently had a massive thing for macrame wall hangings. They’re a perfect touch to any rooms if you’re into the boho trends! I’m also a big print lover, I’ve seen gallery wall after gallery wall on Pinterest and I’ve become a tad obsessed. I love how you can mix and match between aesthetics and sizes to create a really unique look! I mean, I already have 4 plants..but you can never have enough plants. Right? I feel like they add this homely touch plus they’re pretty aesthetically pleasing. I like to challenge myself and keep real plants. It’s also nice to see them grow, I feel like a proud mum. But of course you can get some great fake plants which means no responsibilities! So there’s my little lust list for my bedroom right now. What interior trends are you loving and what’s on your wishlist? How To Go Island Hopping On A Budget. I love love love the statement mirrors, but I think the little ornaments are so beautiful as well- especially the ones with the crystals. This is all so cute together. 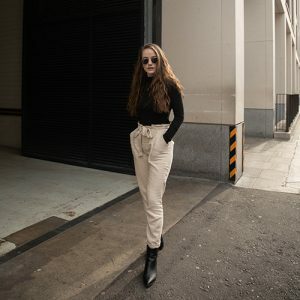 Why have only just discovered your blog! Love your wish list. We have just moved and I really want to decorate especially the walls but the husband is adamant on not drilling holes in them! I still need to work my way round that! I really love all the hexagonal stuff around at the moment. Mirrors, clocks, prints. I just love the uniqueness of the shape.